7/20 Cup of Coffee: Pitching was the story on Tuesday in the Red Sox system. While Rick Porcello and friends were shutting out the San Francisco Giants for the major league squad, Matt Kent (pictured, right) and Brian Johnson turned in scoreless outings for Salem and Lowell. The hurlers for Pawtucket and Portland also submitted quality starts. Right-hander Justin Haley spent the night working his way out of trouble, surrendering only two runs in 6 2/3 innings despite allowing 12 baserunners. Haley gave up 10 hits and walked two while striking out four in picking up the win. Robby Scott had another strong outing in relief, throwing two scoreless frames, allowing a hit while striking out a pair. Roman Mendez recorded the final out to get credit for the save. Christian Vazquez had a hand in all of the scoring for the PawSox. The catcher hit a decisive three-run homer in the fourth, his first since rejoining Pawtucket. He later singled off old friend Drake Britton (DET) and scored an insurance run on a Jantzen Witte base hit. Overall, Vazquez was 3 for 4 on the night to break out of a 4-for-27 skid since he was optioned. The Sea Dogs squandered a strong performance by Mitch Atkins, who allowed only two runs on three hits in six innings. Atkins struck out six and walked only two, settling for a no-decision. Williams Jerez took his fourth loss in the last three weeks, allowing the decisive solo home run in the seventh. Andrew Benintendi turned in a two-hit night, delivering his 11th triple between two levels this season. Thunder pitching was finally able to keep Yoan Moncada at bay, halting his on-base streak at 15 games. A pitchers duel turned into a battle of bullpens as the Red Sox and Nationals matched zeroes into extra innings. Salem starter Matt Kent was dominant as he locked horns with 2014 first-round pick Erick Fedde (WAS). Kent scattered three hits across eight shutout innings, striking out eight. One of his two walks was intentional, and he needed only 83 pitches to complete the eight frames. The lefty retired the first nine batters he faced, and ended up going deeper into the game than his manager. Salem skipper Joe Oliver was ejected in the top of the eighth when the umpire ruled that Deiner Lopez did not touch second base on a force attempt. Jamie Callahan took over for Kent in the ninth, and didn't miss a beat. The 2012 second-round pick fired three shutout frames, allowing one hit and striking out three without giving up a walk to earn the win. After a long night without scoring, Salem struck quickly with the decisive rally in the 11th. With one out, Rafael Devers ripped his second double of the night. Nick Longhi followed immediately with a two-bagger, plating Devers with the winning run. Devers and Longhi now have 22 and 23 doubles on the season, respectively. The former also singled in extending his hitting streak to seven games. The slow start to the season by Devers now seems like a distant memory; his performance has improved each month, and his July line now stands at .400/.444/.707. Reed Gragnani also turned in a big game, going 2 for 4 with a walk. Gragnani has hit safely in six straight games. 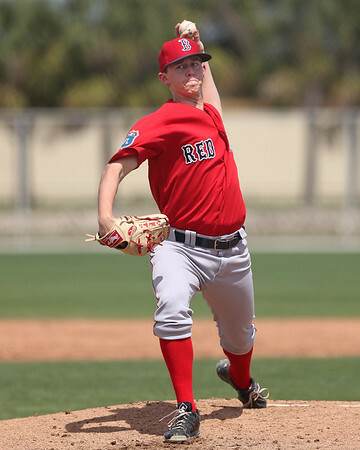 Brian Johnson took the mound at LeLacheur Park and looked as you'd expect against Short Season-A ball batters. Johnson, who has one major league start in his career, faced little resistance from the Spikes lineup, giving up only three hits in six innings. He struck out six while walking one and throwing 47 of 68 pitches for strikes. Johnson has allowed zero runs in two rehab starts with the Spinners; he is working his way back from an anxiety disorder that sidelined him for six weeks. State College had better luck against a trio of Spinners relievers. Daniel Zandona surrendered a run in his 1 1/3 innings, Algenis Martinez took the loss after giving up a pair of runs in 2/3 of a frame, and Matthew Gorst allowed a ninth-inning insurance run. It was only the second time in eight appearances that Martinez was scored on. The Lowell offense collected only five hits. Chris Madera was 2 for 4 with a double and is now 8 for 16 in his last four games. Carlos Tovar also collected a pair of hits, while Victor Acosta notched his first double of the season. Little went right for the Sox, who have now dropped five of six head-to-head contests with the Orioles. Twenty-third-round pick Juan Carlos Abreu picked up his first hit as a professional with an eighth-inning double, but the 19-year-old was thrown out trying to stretch it into a triple. Stanley Espinal drove in the Red Sox' only run when he plated Nick Hamilton with a sixth-inning double. Hildemaro Requena took the loss, giving up four runs (two earned) on five hits in four innings. He struck out two, walked two, and surrendered a solo home run. Devon Fisher, who is converting to pitcher from behind the plate, allowed three runs on two hits in his inning of work. The Red Sox bounced back from their season-long two-game losing streak to knock off the hapless 7-31 Marlins squad. Rayniel Adames got the win, allowing a run on three hits in five innings while striking out seven and walking four. Oddanier Mosqueda struck out four without issuing a walk in his three innings of scoreless relief, while Junior Figueroa punched out a pair in a perfect ninth. Ricardo Cubillan was the offensive standout, going 2 for 3 with a double, run scored, RBI, and walk. Warlyn Guzman, who had been working out of the bullpen in both short relief and piggyback roles, turned in a solid outing in his first start of the year. Guzman allowed two runs on five hits in five innings, striking out six while walking only one. Ronald Gutierrez took the loss, surrendering three runs on two hits in one inning. Yeison Coca and Fabian Andrede had two hits apiece in the losing effort. Juan Hernandez continues to be a key contributor to the Red Sox offense, going 1 for 3 with a walk and a run scored. Player of the Day: The Red Sox have had some success selecting pitchers from Texas A&M. In recent years, Casey Fossum and Alex Wilson have made the journey from College Station to Fenway, and Kyle Martin is knocking on the door. Matt Kent, a 13th-round pick last June, is looking to join that group as he continues his impressive season. In 17 starts with Salem, Kent has a 3.23 ERA and 77 strikeouts against only 21 walks. The eight innings and eight strikeouts he had on Tuesday both represent career highs for the 23-year-old left-hander.